Summary: Vincent has a pretty idyllic life as a ship’s cat, traveling from one place to another and observing them all from the deck. 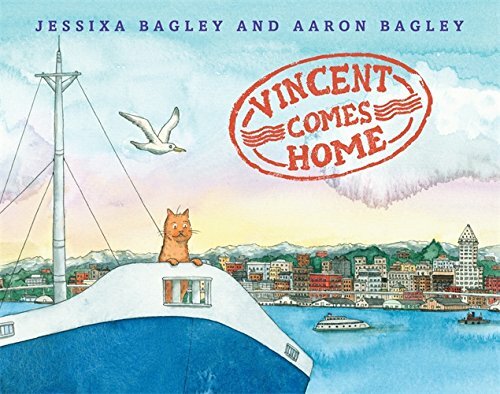 When he hears sailors talking excitedly about a place called home, Vincent is curious, and hopes to visit it someday. When that day arrives, Vincent can’t understand what all the fuss is about. Home looks just like many of the other places they’ve been. For the first time, he gets off the boat and follows a member of the crew, observing through the window how happy he and the others are in their houses. The cat realizes sadly he doesn’t have a home; then he hears a familiar song and is reunited with the ship’s captain, who scoops him up and says the magic words, “Let’s go home.” 32 pages; ages 3-8. Pros: A charming story about the pleasure of coming home after exciting adventures. The illustrations are delightful, and cleverly identify the captain by showing a bar of music in the early pages that is used again to recognize him at the end. A very cool world map shows the ship’s travels from one continent to another. Cons: The crew is all male and the member Vincent follows is identified as “a crew man”.